Large dead branches, or broken branches that are still hanging in the tree. Look for these now and, for deciduous trees, look again after leaves have fallen. Tight crotches between major trunks or limbs. Cracks can develop in the joint. The wider the “V”, the better. Look for vertical cracks in the main stem, too. Cavities high in the tree where limbs have broken off and decay has set in. Good for squirrels and raccoons but not good for safety. Look for these also after leaves are gone. Damage to the trunk near ground level from some long forgotten accident. There may now be a dead area, the bark is gone or there may be oozing, mushrooms or insects, indicating that a weak spot is developing. Signs that the ground level has been changed around the tree; soil is now higher up the trunk than originally, perhaps from a flower bed being heaped around it. Crown rot from unwelcome moisture in this area can create a weak point, too. Construction in the root zone: nearby ditches, driveways, or sidewalks where root growth is limited; or, where roots may have been severed or the soil compacted. 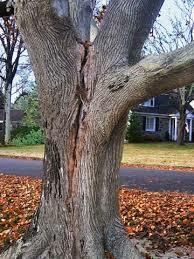 A general decline in the tree’s health as shown by dieback in the top of the tree, early discoloration, or leaf drop. Or perhaps, particularly if erosion has taken place nearby, it is now leaning more than before. Murphy’s law, I think it is, says that a tree will fall at the worst possible time, in the most damaging direction. If you have any suspicion about a tree, I suggest you bring in a certified arborist to survey the situation.